this is my first week of being home after two weeks of straight travel, from jacksonville to dallas to newark. the easiest thing about packing for me is my travel toiletry bag. I leave my clear TSA-friendly bag under my sink all ready to go at any moment and over the years of both domestic and international travel, its contents have become tried and true. and to be honest, this post is brought to you by an extremely loud elevator at a radisson inn in freehold, new jersey. of course, there are the practical requirements such as a spare pair of contacts and antiperspirant, which are must-haves. BUT... the number one most-used item in my travel bag is earplugs. I find myself sleeping with earplugs in most hotels because, although I can fall asleep at the drop of a hat, the sound of hotel air conditioning definitely wakes me up. and seriously, in my last hotel, the constant sound of the elevator was not unlike a steady freight train. I mean who can sleep through that? not me. so, let's get to it. I've also recently started to travel with my clarisonic. I never used to travel with this but now it feels like a small luxury from home that I can't live without. yay, soft skin! 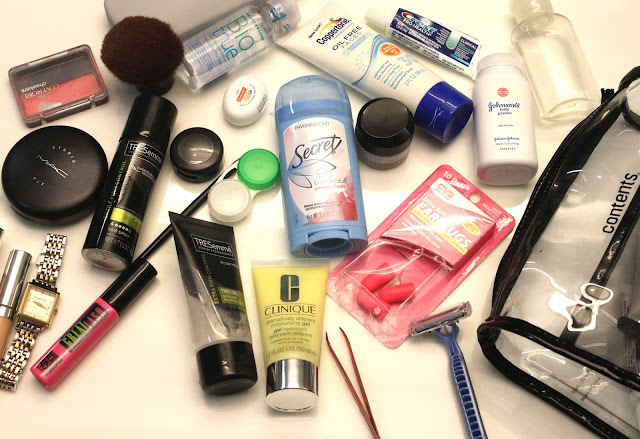 a few other items that I always have in my bag are an extra hair band, razor, and tweezers. for international trips, I throw in ambien and a selection of medicines from a travel doctor including a zpack. I actually throw in a lot extra for international trips because you have to consider that you likely won't be able to find even the over-the-counter medicine you may need. for example, while I never need tums at home - I would put them in my bag just in case. better safe than sorry... or sick.